Pick up a pen. Write something down. Describe a character. Talk about a setting. Introduce an idea. Tell a story. Weave an epic. Be a writer. Writers write about the world and all of the people and passions in it. Using your keenest senses, start a writer’s journal, where you take notes about what you think, what you see, what you imagine and what you dream about. Writing is a release of ideas. Releasing ideas - words and actions and feelings and observations and theories- and writing them down, helps to record our thinking. Everyone has ideas, but not everyone pays attention to them. Ideas are like seeds that need nurturing and care to help them develop. Keep a writer’s journal. Record the seeds of your ideas - your characters, scenes, events, story lines. Go back every once in a while and review your notes. Some of your ideas will return to you again and again. If you find yourself thinking about these ideas, these are the ones you should develop. Work on them. Add to them. Start with words and try word mapping to expand them. Develop outlines expanding your understandings of people, places things and events. Write an essay. Write a short story. Write a persuasive speech. Write a novel! Write and record your ideas! Choose 3 objects. Draw or photograph them and place them at the top of a piece of paper. On the left side of the paper, write the name of the object letter by letter vertically in a large font size. Beside each letter write a word starting with that letter that describes the object. Snip! Cut! Instrument Sharp Snip!! Open and close Razor edged Sharp!! When we write with words we write in sentences. Sentences are a series of words that include a subject, a noun, and an action, a verb or predicate. For example, “You sit” is a sentence. It has a subject and an action. Sentences always have these two types of words. They can have compound subjects and compound predicates. For example, “Dog and cats sleep and eat.” This sentence has two subjects and two activities! There are, of course, many other words that can contribute to writing a sentence. In fact, there are adjectives (descriptors of the subject), adverbs (descriptors of the actions), prepositions (in, on, at, to, above, below, under, etc. telling where) and other additions to make the sentence more communicative. Write simple sentences using this sentence diagramming page. A paragraph is a series of sentences about one topic. It starts with a main idea. It then adds sentences that give examples, share details, explain or persuade. The sentences in between the first (main idea) and the last sentence can be written in chronological order, in order of importance or through juxtaposing contrast and comparison. Chronological order uses words like first, then, next and last. Sentences in order of importance use words like in fact, however, because, furthermore and yet. A paragraph ends with a concluding sentence. The concluding sentence is a restatement of the main idea or a summary of what has been shared. Connect sentences into paragraphs. Connect paragraphs into essays. 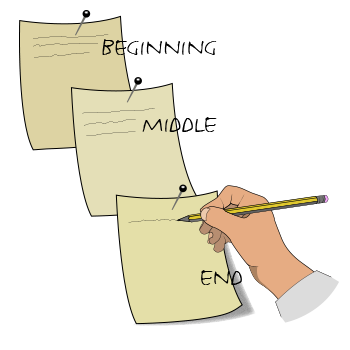 Activity 4 – Beginning Middle End! Writing is a wonderful way to share events, memories and imagination. Writers usually keep journals with them so that when a thought, idea, character or event occurs to them they can record it. Writing can start spontaneously or can occur at regular times. For this activity, you will write a short five paragraphs about an important event in your life. To organize your writing, decide on an event and develop an essay outline. Use the essay map. 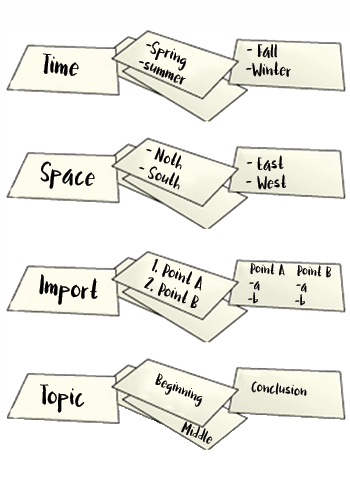 Start the essay map with three sentences about the beginning, middle and end of your event. Then expand each into a paragraph that describes in greater detail the setting for the event, the main characters and the sequence of activities. For each, add supporting details. Finally write a concluding paragraph that summarizes your event, reveals what you have gained from the experience or what you hope the reader will take away from learning about your happening. In this sequence, do not leave us hanging! Start your story, open up our imagination to anticipate the event; write in detail so that we, your audience, feel like we experienced what happened to you. Did you know that you can organize your writing? Organizing your writing comes with understanding simple patterns. Let’s start with four main ones- Time, Space, Import, and Topic. Time is relatively easy to understand. What happens first? What happens next? When used to organize writing it arranges ideas, events and consequences in chronological order. Time organizes a sequential pattern with first, next, and then. It works well when telling stories and ordering explanations. Space locates ideas, events and consequences through physical positioning, cardinal directions, and placement in the world at large. Writing can also be organized by order of importance. This pattern commonly arranges items from least to most important. It includes transitions such as more importantly, most and by far. It can also be used to arrange events in psychological order. This method of order of importance puts the least important information in the middle, with the more important information at the beginning and the most important information at the end. The Problem to Solution method states a condition and then follows with possible ideas to resolve the problem. 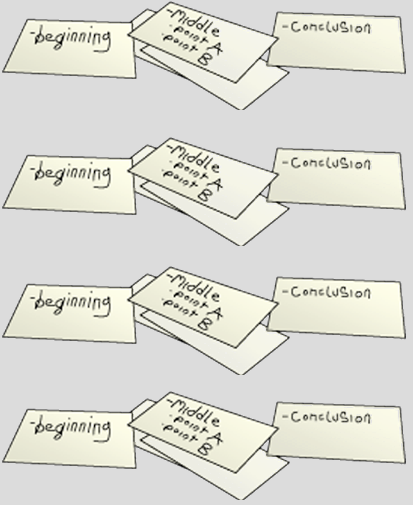 Organizing your writing helps to present your ideas in clear and succinct ways! 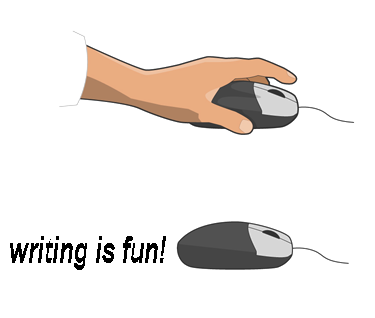 There are many different types of writing. This activity helps you better understand the power of words. Find a building in your community that interests you. You will write five paragraphs about this building. Each paragraph type will build on the information presented in the prior paragraphs. To begin, you will merely describe what you see when you look at the building. How many stories is it? What is it made out of? What is its name? Next, you will research the history of the building and find out if the building is built in a certain style or is a certain type. In this paragraph you will build on the prior paragraph’s information and add additional historical or typological information. (See Building Types and Styles of American Houses journeys). Be sure to use specific vocabulary that connects your building to other building types or styles. Paragraph 3 will build on paragraph 2 by further explaining the organization of the house. Write about how it is set on its site, on a block, in a garden, etc. Describe your approach, entry and path through the house. Leave the reader with a better understanding of how the house is organized, how the rooms are connected and what rooms are included. Paragraph 4 should make use of metaphors, similes and analogies to interpret the experience of the building. A metaphor is a writing tool that interprets the sense of a word or aspects of a word (usually a noun) with another word. The building rises with protective castle walls. A simile is an analogy that uses the word “like”. For example, the building towers like a fortress. An analogy is a word relationship including synonyms (similar meanings), antonyms (opposite meanings), part to whole (windows to facade), category (building, hospital) and finally descriptor (grey steel). 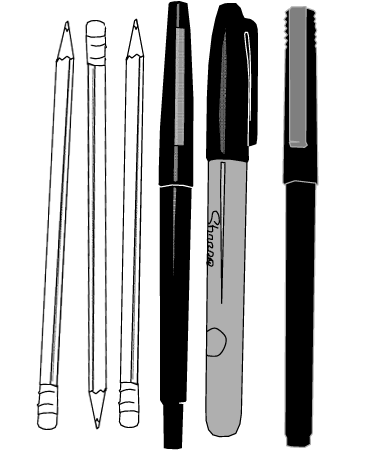 All of these writing tools strengthen your ability to communicate ideas. Paragraph 5 is the opportunity to move from facts to opinions and arguments. It is a chance to analyze the building and to increase or decrease your reader’s appreciation (or lack thereof) of what the building is. When evaluating, carefully choose descriptor words that are positive if your evaluation is positive and the reverse if your evaluation is negative. Creative writing is writing that goes beyond simply conveying or explaining information. Creative writing, like poetry, expresses thoughts, feelings and emotions. It is the kind of writing that when we are reading we can’t put it down. Our heart races as we turn the page or we find ourselves wondering what will happen next! Grab your audience’s attention! Start with a compelling line. Catch us off guard. Wake us up. Once you have your reader’s focus, you can deliver your information in an engaging and organized way. Using the Persuasion Map, think of a way to improve your school. It could be to stop plastic water bottles for sport teams, create urban agriculture beds, turn off lights in unused rooms, create outdoor classrooms. Once you have your idea, write a statement about your idea. This is called a thesis. Next, come up with at least three reasons (facts or examples) to support your ideas; site successful case studies to support your reasons. Finally, finish with a positive conclusion. 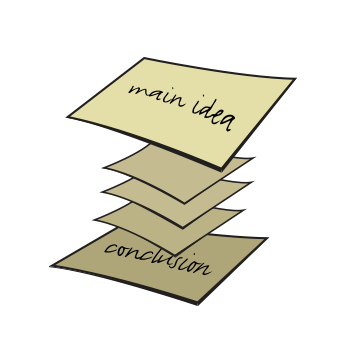 Your conclusion should be a memorable synopsis of what you want to do and why it is important to do it. Persuasion is a powerful writing tool! When we write we often research our topic and find other information which informs our writing. We may choose to quote from these sources directly, or we may paraphrase or rewrite their content in our own words. Watch this short about Paraphrasing & References. In either case, it is important that we recognize and credit all sources used directly and indirectly in the writing that we do. To use someone else’s writing intentionally or even unintentionally without giving credit to its author and citing where it appears is known as plagiarism. Plagiarism is a disciplinary offense and subject to charges. To learn more about what plagiarism is and how to avoid it, watch Citations for Beginners. Citations record the Author’s name, the title of the writing, the date it was written, and where it was written and by what publishing house. 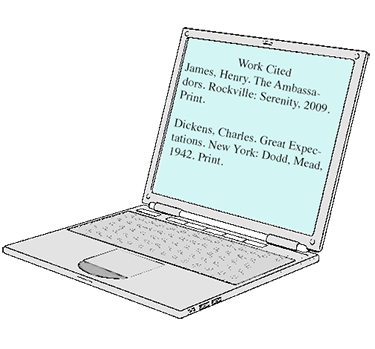 To assist writers with the creation of a bibliography, there are platforms such as easybib.com. And finally, there are four main methods of creating bibliographies, including how to list online references. They include the [MLA Modern Language Association](, the APA American Psychological Association Style, the Chicago Style, and the CSE or Council of Science Editors. Remember to always cite your references!